The Land of the Fanns team have been busy once again, right across the project area from Havering Country Park to Davy Down, and Weald to Belhus, on projects ranging from photography workshops to river clean ups and tree planting. We have hit an all time high on our social media with 91 followers on Twitter and 60 likes on Facebook. Check out our Friday facts on Twitter and other posts on both Facebook and Instagram which we update weekly. Once again thank you to all our stakeholders for support with all of the Land of the Fanns projects. You will be pleased to know we are already making plans for next year’s Thurrock’s Next Top Boss! Are you looking for funding for your next project? The Land of the Fanns Community Action Fund could be for you! If you have a project in mind, please let us know about it. The fund is open to schools, community groups, residents associations, scout groups, friends groups, church groups and social clubs within and surrounding the Land of the Fanns project area, for projects that compliment the wider scheme and meet some of our main objectives and vision. £15,000 will be available through each round of the Community Action Fund to deliver projects of up to £5,000. The current round has now closed but the next round will open on 1st September 2018 with a deadline of 31st January 2019. For more information on the Community Action Fund and how to apply visit the Community Grants page. 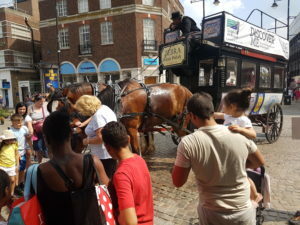 We have been working with Discover ME and recently re-launched the project in July with a Horse n’ Carriage tour, which was one of our free events open to the public, on a traditional Omnibus. The trip was a great opportunity to visit a number of Discover ME heritage sites including the 17th century barn which is part of the Thames Chase Forest Centre, the wonderful museum of nostalgia at the Tithe Barn, the Windmill and Old Chapel in Upminster and Havering Museum in central Romford which coincided with their Titanic exhibition. Land of the Fanns will be working with Discover ME in the future to help support and promote local heritage sites. Check out the website at discoverme.london. Watch out for the Land of the Fanns travelling archaeology exhibition we have been developing with Museum of London Archaeology (MOLA). The exhibition, which is designed to tell the story of the unique history of the Land of the Fanns, will be at the Orsett Show on 1st September and Apple Weekend at Thames Chase on 21st October. We will also be launching our Built Heritage learning programme with project partners MOLA, engaging communities with their local historic buildings in early 2019. We have been speaking to project partners Thurrock Council, Essex County Council and Rural Arisings about developing Historic Landscape Plans around Belhus Park and Thorndon, both grade II registered Parks & Gardens. This will be the first stage of the Land of the Fanns Connecting Historic Landscapes and Designed Landscapes Projects with the aim of mapping and restoring key heritage features in the landscape. 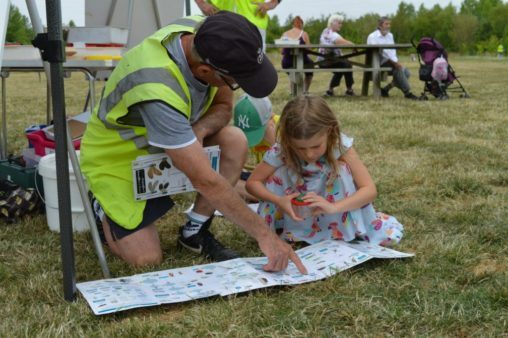 As part of a double bill of free Land of the Fanns events in July we also held our first Bioblitz event with Thames Chase Trust and the Forestry Commission. 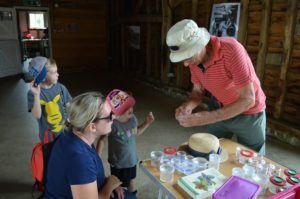 It was great to see so many families enjoying the chance to meet wildlife experts and find out about the mini-beasts and other wildlife that inhabit the woodlands, meadows and stream around the Forest Centre at Broadfields. Whilst we continue to progress with key projects including the Rivers projects along the Rom, Ingrebourne and Mardyke, the walks programme and interpretation projects, we have also begun to develop a number of new environmental projects since our last update. These include a Land of the Fanns Landscape Management Plan where we hope to engage with local landowners, a community tree nursery, an outdoor learning programme and a habitat restoration programme aimed at restoring local areas of relict Essex heathland and acid grassland for example at Tylers Common. Calling all budding photographers! With a top prize of £100 in vouchers and two runners up prizes of £50 and £25 in vouchers, you have until the end of September to send us your photos. We will be looking for inspiring images of the Land of the Fanns landscape, built heritage, communities and places that are special to you. You can submit up to 3 photographs. See website for rules. Finally I would like to say a big thank you to Veolia Maintenance Trust who have recently awarded the Land of the Fanns Landscape Partnership Scheme £221,970 towards a number of projects that will be happening over the next 12 months. This mean we can now unlock more of our Heritage Lottery funding and deliver some more great projects! We would like to take this opportunity to wish you an enjoyable summer!